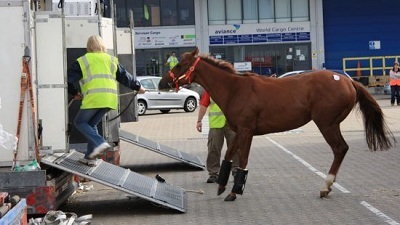 A team of British vets and transport engineers attempt to move fifteen racehorses worth a total of $4 million over 10,000 kilometers from England to Hong Kong in a specially adapted Boeing 747 aircraft. We follow the horses being transported to Britain's 3rd busiest airport, Stansted, where they are loaded into special stalls and transferred into the cargo plane. The stalls are secured to the aircrafts fuselage to ensure they remain stable if the horses become agitated during the flight. During the 12-hour flight, a team of vets on-board monitors the horses to ensure they eat enough food and avoid dehydration. Semoga artikel tentang National Geographic - Animal Mega Moves: Racehorses (2012) HDTV 720p bermanfaat untuk anda dan jika ingin mencopy artikel ini mohon untuk meletakkan link dibawah ini sebagai sumbernya.